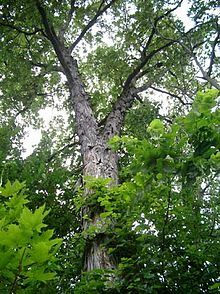 The shagbark hickory tree is a very common plant in temperate deciduous forests. With it's distinctive, ashy bark, the tree is very strong and can grow over 100 feet tall. Its branches tend to grow out horizontally and droop down slightly. The shagbark hickory also produces edible nuts that are essential to sustaining life in the forest.